← Which Wireless is Right Wireless? ummm, by using a proper networking solution? A pair or 20.00 moca adapters and you are good to go. Ethernet in and out coax in between. 1ghz speed full duplex. This. MOCA is specifically designed for this function, and it’s dirt cheap. I’ve used it in a stadium to deliver ethernet over old crappy RG-58. Works great, even through splitters. Yes, MOCA looks extremely interesting and useful for this application. I had never heard of this standard and these devices don’t seem to be available anywhere here in Germany. But I have found a source in the Netherlands and will import 2 such devices and have a play around with them. I don’t think the $20 adapters will actually do a gigabit, although they will coexist with the Wifi over coax solution. The above will coexist with cable/antenna TV and DOCSIS, with the exception that older MOCA adapters do not coexist with newer versions of DOCSIS. Homeplug adapters can also be hacked to run over phone line and will coexist with analog telephones, but not DSL. Many years ago, I stayed at a hotel where the Wifi was provided by a little Cisco box slightly bigger than a portable hard drive that goes between the TV and coax cable. Not sure exactly how it works but it does have its own power supply and I suspect it’s just some RF frequency translation hardware, with the smarts in the central controller. Actiontec as a cheap source of MOCA bridges. 5GHz will suffer attenuation greatly on “TV grade” coax. True, the usable cable length is going to be shorter than the other solutions. Of which, maybe something worth looking into is running 5GHz Wifi using air ducts as waveguides? I just installed three Motorola MOCA 1 GB adaptors in my house… I have a ton of coax to all the rooms but, unfortunately, no easy way to get cat 5/6 where I need them to go. So far it’s working great, faster than my wifi, and took some of the load off my wifi for the things I can’t hard-wire. That’s a pretty slick idea, and I really like it. I’d never have considered doing this. The mismatch between 75 ohm and 50 ohms isn’t horrible, and in fact many hams use 75 ohm cable because it’s cheap and abundant. Yes, they do – but they also use antenna tuners, transmatches and similar gear to adapt the 75 ohm impedance to the 50 ohm that their radio needs. That’s not what has been done here. I used to use a 170ft run of 75 ohm coax on hf. The swr was 1:1 because the signal loss attenuated any reflected power. In the wifi band coax cable will be extremely lossy. Depends on the coax though. RG59 gets really lossy on long runs, RG11 will be a third that. There’s a standard called moca for sending data over residential coax lines. Not quite as hacky, but quite convenient. Problem is finding it reasonably priced compared to anything else. Invested money in it and it couldn’t do a lot of nodes. The problem may be too strong signal. Maybe try with a 30dB attenuator in series. I think it’s more likely reflection from the impedance miss-match. I would try a 75 ohm to 50 ohm balun. Just wondering if Tobias has asked those “amateur radio operators in the house” to look at his setup. I do not know how big his building is, but if WiFi can bridge 20m of thin air then it can probably bridge more of that through some (decent) coax. How many walls would you be able to cross with 2 cantenna’s? Some government 3 or 4 letter acronyms may not like this idea, but if it has a big vertical component (from the basement to the attic) I do not see a ral reason to worry. Heh, I‘m the Ham myself and my neighbor is licensed, too. Instead of trying to impedance match the cables I tried a length of 50 Ohm coax and it didn‘t work much better. I will try some attenuators next and see if that works any better. Properly built wifi could maybe work, but I have really thick walls out of clay and some metal insulation stuff and it‘s not too nice for wifi. Gods, why am I thinking of Videodrome now? Radio waves don’t do well with metal, and a thin layer of aluminum foil will block it really really well. Or just a resistive impedance match, losing a few dB is not an issue in this setup. um, actually he used standard Wifi routers. The LimeSDR just gave up its UFL-SMA adapters so he did have to wait for $shippingCompany to bring him some. Would have been cool to try that. Like he says, the reflections from the impedance mismatch is causing the modem to select a larger guard interval and use a smaller QAM constellation. So why not try an off-the-shelf 75/50 ohm transformer, or maybe even just throw one together with passive parts. It seems it would improve the transfer rate dramatically ? Here using even a simple resistive voltage divider would be beneficial as impedance matching device, decreasing both reflections over the line and transmitted signal level hence the distortion at the receiver. A good quality RF attenuator (not needlessly high power) would also act as a pretty good impedance matcher itself, because at its output it would be really close to line impedance no matter the impedance of the transmitter/receiver, and the reflection at the receiving end is what disrupts the transmission the most. “but there are amateur radio operators in the house, and they put out a bunch of interference and noise”. Sounds like the ones I know too! I would rather bet that the reason for “interference and noise” is the crappy consumer gear that is not shielded and often lacks any filters for out of band strong signals. Amateur radio operators (HAMs) are extremely careful to not cause interference outside of their allocated frequency bands because there are large fines for that and in the worst case they could even lose their license. Put the blame where it belongs, shall we? I think you missed that the comment you’re replying to is a light-hearted joke. I think the article text is actually saying networking over power cables would radiate too much noise for the amateur operators’ liking, not that the amateurs were the source of the radiated noise. You can get Ethernet to coax converter ICs. Check out the EQCO875SC-HS from Microchip! This is where the isolation from a proper balun transformer would be doubly useful. Everyone with a smidge of RF smarts knows what you’re trying to say, but let us expand that to..
For the benefit of those not totally familiar with radio. Also capable of miscomprehension because wifi is becoming a colloquial synonym for internet connectivity in general and it getting lodged in people’s head that the internet is 50 ohms. That said, I’m wondering why a house full of hams couldn’t rig an impedance matching balun. I pretty solidly understand the impedance on coax, but completely lost when it said “wifi is 50 ohms” rolled it over I my pre-coffee head a few times to ‘wifi antennae must be 50 ohm.’ Good to get a clarification, not yet being well versed in RF. “If it’s stupid and it works, then it’s not stupid.” Uh,,, NO, it’s probably still stupid! These cable types are not rated at all for use above 1 GHz., and the impedance mismatch causes other issues. Just because something “seems” to work does not mean its not causing other problems. Like causing interference with your next door neighbors baby monitor or “I’ve fallen and can’t get up” devices for the elderly. “Ethernet over power lines was an option, but there are amateur radio operators in the house, and they put out a bunch of interference and noise.” Manybe the ones from like 10 years ago, but nowadays this is just not the case. a TP-Link AV2000 2000Mbps Powerline Ethernet Bridge, or Comtrend G.hn 1200 Mbps Powerline Ethernet Bridge will be just fine for the Hammers. I’m more shocked that the “amateur radio operators” didn’t have a fit knowing you were going this route mismatching things. Ha, I’ve always resented the old “if it’s stupid and it works” saying. There are millions of things that work, yet are still stupid. Maybe something like starting a BBQ with dioxygen difluoride. Will it catch on fire? You betcha. Is it incredibly, insanely stupid? Oh, most certainly. Not that I’m criticizing this particular project, I don’t have enough RF knowledge to do that. But even the saying about stupid things that work is itself something that works yet is still stupid. It convinces people, but it’s also completely wrong. This is using high quality sattelite TV coax, not “regular” TV coax. It’s highly shielded, recommended up to 3 GHz and the manufacturer states a 6 GHz attenuation figure in it’s datasheet. Yes, the impedance mismatch, too high signal levels and missing electrical isolation between the devices is a problem. I’m going to address these issues in some further experimentation, some proper attenuators should do the trick for the most part (well except the isolation thing). I own a pair of AV1200 TP-Link gear and tried some Devolo-gear from a friend, both still generate interference. The HomePlus AV2 standard states that TX power in the ham bands need to be at least 30dB less, but that doesn’t help me if these things are in the same room as the radio. If you take some precautions the electrical isolation shouldn’t be a problem. Just make sure the PSUs are properly isolating, replace them with older, linear non SMPS(Us) or put small proper isolation transformers on all PSUs. Assuming none of the APs are actually using the PE (protected earth) from the mains wiring this should take care of the power side. Using only unshielded (UTP) cat > 5e Ethernet cables or ones where you strip on plug and attach a new one without connecting the shield (thus making one-side-only-connected-shield-cables) to connect to the APs should isolate other networked devices from the WW-LAN (WiredWireless LAN). The twisted pairs them selves are connected to isolation-transformers on both sides anyway. Depending on the physical size of the WW-LAN, the overall grounding of and inside the building and what else uses the coax cables, it may be prudent to invest in some overvoltage surpessors/arrestors with F-connectors (like AXING SZU 6-02) and proper earthing of the coax shield, too. “a TP-Link AV2000 2000Mbps Powerline Ethernet Bridge, or Comtrend G.hn 1200 Mbps Powerline Ethernet Bridge will be just fine for the Hammers” Last year I have do a EMC test of a product integrating a such modem. It showed very width modulated frequency band with a lot of energy far above any acceptable level. Reducing the multiples modulations slots to the industrial conformance level trashed to transmission capability to just a few Mbps. This things radiate a lot because the power lines are just copper wires never designed to carry RF frequencies. Still an acceptable solution in a lot of residential situations, but sometime it just hurt to much. This (and moca) sound interesting. I have a WiFi proof house due to got air heating ducts. It would be tricky to run CAT6 in places but a previous owner “future proofed” it by running coax everywhere for TV. Now that would be a solution worth talking about! I’m disappointed that the sdr is only used for it’s pigtails. My biggest problem with this, is that it defeats a safety built into wired ethernet via transformers, and wifi via air-gap. Galvanic isolation.. I think the last place I want to see a GND difference that can sink current is in my wifi antenna’s ground. That router’s ground is now being dragged around by it’s coax ground, the only reason it’s ‘safe’ is because it has an isolation transformer on it’s DC input and the already mentioned ethernet transformers as well. So it’s effectively isolated to that single point for the moment. MOCA is cheap and you can find adapters on Amazon easily. The only thing you have to do if put a filter on the head end entry point for the cable into the house to make sure the MOCA adapters signal doesnt bleed out into the neighborhood. Gross losses due to Impedance Mismatch? Pffft! Anyone who’s already chimed in so far, (and been dumb enough to also state that they additionally hold a Ham Ticket), should immediately surrender said Ticket and hang their head in shame! When you ‘couple’ a 50ohm source to a 75ohm load, you’ll only have a minuscule VSWR mismatch of 1:1.5 to contend with. Meaning that at worst case, a successful transfer of around 95% of the RF energy will occur at each point of mismatch, with about a 5% reflection of the RF back to its point of origin. With this mismatch occurring twice, (once at each end), the total worst case theoretical loss across a pair of said mismatches, (by assuming a zero feedline loss between each mismatch), weighs in at just under 10%. Given that the TX PA found within the average Wi-Fi Access Point typically has to contend with substantially higher levels of VSWR, (when coupled to either their poorly designed factory supplied antennas, or antennas that are poorly placed up against other cables and/or metallic surfaces), all of this carry on about “Impedance Mismatch” sure does seem superfluous. Another nails-on-chalkboard issue for me, is people who still insist on referring to plural antennas as “antennae”. Again with the misdirected comments, surrounding “all of that attenuation” found on 75ohm Coax. An utter Cane-Toad-load of RF is still going to arrive at the other end – even on RG59 – when compared to the brutal attenuation experienced by any RF signal traveling through free space. Depending on the sensitivity of the RF silicon at each end, you’re likely to damage each Wi-Fi Access Point due to front-end overload, without substantially limiting the RF signal to begin with. Most Wi-Fi devices will deliver you the highest level of MCS they are capable of delivering, one you achieve a minimum level of signal of at least say, around -50dBm of received signal strength. Turning each device down from 17dBm, (typical for most devices, which is about 50mW of TX power), down to around only 0dBm, (which is only 1mW) – and then running a connection across 30 feet of RG59, will still result in an extremely strong -20dBm of signal! Even Wi-Fi on 5.8GHz is easily done, as RG59 will only attenuate a little over 30dB per 30 feet at this frequency – so have at it! Remember, all you’re trying to do is land the RF arriving at the other end ‘light enough’ so as not to damage the receiving RF silicon, but still strong enough to allow the transceivers to negotiate the highest possible MCS that they are capable of. A signal received at the far end that’s anywhere within -20dBm and -50dBm, will do you proud. As for achieving 2×2, (or even 4×4), MIMO over a single run of Coax – that’s also trivial. Reverse feed a pair of 75ohm 2-way splitters, (or a pair of 4-way splitters for 4×4 MIMO), at each end – fitted with individual 10dB attenuator pads on each port to prevent cross-port TX damage, and at one end, use dissimilar tail lengths out to each individual antenna port – just to introduce the required phase shift. Could you elaborate a bit on the “and at one end, use dissimilar tail lengths out to each individual antenna port – just to introduce the required phase shift.” part? I use 2 of Zyxel HLA3105 and works good over coax, i fund it on ebay for 30 USD each. What an utterly daft thing to say. “Assume A. B. Therefore not A”. Perhaps you were going for “if it looks stupid, but it works, then it’s not stupid”. Even then, as pointed out elsewhere, there are innumerable things that remain stupid despite ‘working’. A few notes about RG-6. The GHz rating on the coax shouldn’t be interpreted as some sort of stopband above which frequencies are cut off, but rather it’s just the highest frequency the manufacturer tested. You can use it for 20 GHz over short runs if you want. Times Microwave has a useful calculator on its site to estimate dB of signal loss. Use LMR-240 and up if you need extra range over 50 ohm assemblies. 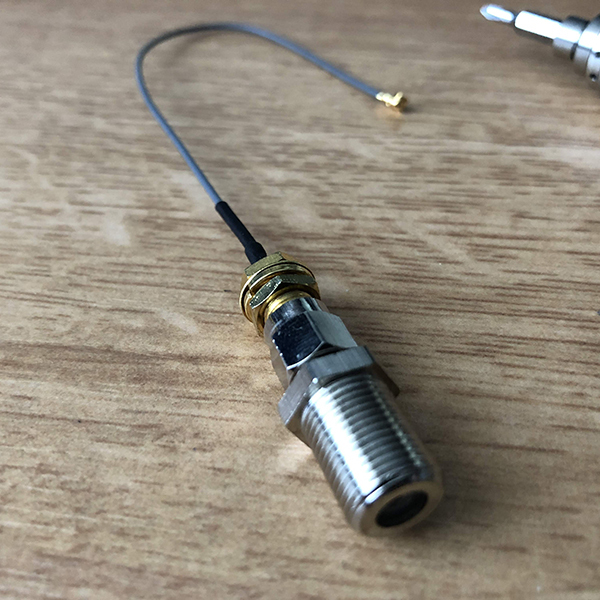 For 75 ohm, RG-6 is probably the best you can purchase from hardware stores, but the cablecos would use QR-320 for a better attenuation profile. Would this work with T pieces and multiple stations ? If your using proper -3dB power splitters instead of literal t-pieces, yes! I think this might be experiment worthy. I often have to demo wifi only kit at trade events and with many hundred other AP’s in the area things get swamped. Static demos, so fudge could be allowed for the sake of the environment without anyone the wiser. Curious solution to the problem of networking to difficult to reach areas. You mentioned in your article that the data transmission speed wasn’t very significant. Perhaps (although I am unsure as to how well this work, its’ range etc) instead of using traditional WiFi with access points, you could try using IrDA (or a variation of Infrared) or perhaps Bluetooth (although I have never seen this implemented) instead. The reason I suggest Infra-red over coax is I know it can be implemented for remotes, a lot of the parts I think already exist, USB to Infrared adaptors are available (unsure if these can both send and receive) and it can operate up to 1 Gbit/s (I think). Please tell me if these are suitable suggestions or are nothing but a pipe dream. 10Base-2 (coax) -> 10Base-T (twisted pair) -> 802.11 over Coax (coax).